External fixation is a technique used to help heal severely broken bones. This type of orthopedic treatment involves securing the fracture with a specialized device called a fixator, which is external to the body. 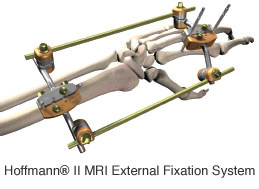 Using special bone screws (commonly called pins) that pass through the skin and muscle, the fixator is connected to the damaged bone to keep it in proper alignment as it heals. How Do I Care For My Fixator Pin Sites Properly? It is important to take care of your fixator and the pin sites to help prevent an infection from developing. In addition to other complications, an infection may require removal of the device, which can interfere with proper healing. Depending on the type of external device you have and the severity of your injury, your hand and wrist surgeon may recommend different cleaning techniques or cleansing solutions. Always wash your hands thoroughly before you clean your pin sites or the device. Be gentle and meticulous, and make sure to dry everything carefully. You should follow this cleaning process routinely even if you are taking prescribed antibiotics to prevent infection. Gently cleanse around the pin sites — After thoroughly washing and drying your hands, dry them with a towel and discard the towel. Then, lightly touch and press your clean fingertips to the skin around the pins. This will cause any drainage to come to the surface. Remove any crust or drainage from the pin sites using a cotton swab saturated with cleansing solution (sterile water). Move the swab in a gentle, circular motion that moves outward from the site. Be sure to use a fresh swab to clean each pin site. Clean the pins — Clean each pin with a fresh, two-inch sterile gauze pad. For the first few days, you may be required to wrap sterile gauze around each pin site until there is no more drainage. Carefully clean the fixator device — Use a combination of cotton swabs and the four-inch gauze pads to clean the entire device. When you are done, dispose of all the soiled cleaning materials, and then wash and dry your hands thoroughly. Take a shower — After about ten days, you may be allowed to shower with your external fixator device (always follow your doctor’s orders). After showering, dry the fixator thoroughly with a clean towel and cleanse the pin sites as instructed in the steps above. If you have any questions about caring for your fixator and the pin sites, talk with your doctor. What Are Symptoms of Infection I Should Look For? Stryker Corporation or its divisions or other corporate affiliated entities own, use or have applied for the following trademarks or service marks: Hoffmann and Stryker. All other trademarks are trademarks of their respective owners or holders.